CNN (better than nothing at all but not by much), overseas (Guardian, Reuters) services and local press are covering the rallies. Somehow it's no surprise that domestic main stream media coverage is less than comprehensive. The Michigan action has been getting less mainstream coverage than middling garden variety tea party stories and, with few exceptions, fails to address the deeper issues. All that means coverage and getting out information is on us, other issue stakeholders and grassroots citizen journalism. The epic fight put up by the protesters in Wisconsin has given us an opportunity. 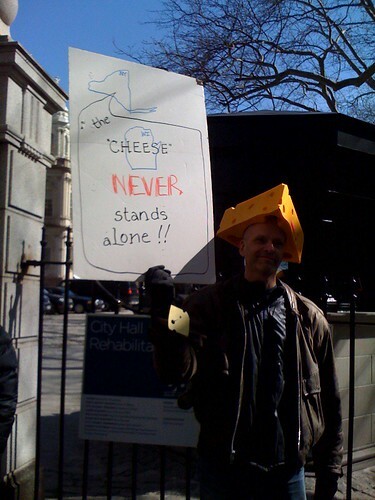 With so many people across the country inspired by the courage of the "cheddar rebellion," we now have a chance build a national movement for a new economy that actually works for everyone. On Saturday at noon, led by unions and the netroots, an enormous coalition of progressive groups are co-sponsoring rallies in all 50 state capitols and many other large cities. 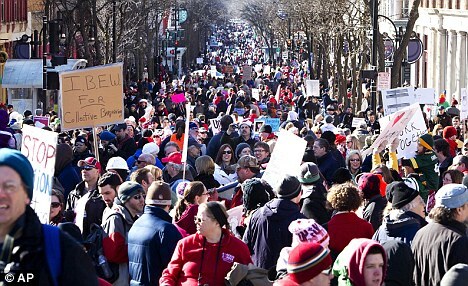 The rallies are a show of solidarity with the fights for workers' rights in Wisconsin, Ohio, Indiana and elsewhere. Tens of thousands of people have already signed up, and you can join them by clicking here. This is an existential fight for unions and the middle class, as Republicans push to make it illegal for workers to collectively negotiate wages and benefits with their employers. They want all workplaces to become dictatorships. Not only can we beat back this attempt to strip workers of their rights, but the energy we are tapping can move the political center of gravity away from Wall Street's black hole. The time to start making this happen is on Saturday at noon, in a town near you. Sign up to attend a rally, and be there for the birth of a new movement. Hello from slushy Madison. After a week of relatively good (for February in Wisconsin) weather, Sunday brought rain, snow, and slush. Networks and local TV and radio coverage don't capture what is going on, partly because most news outlets are corporately owned. Being part of a very diverse Saturday crowd of 70,000+ who support workers' rights was a wonderful experience. While our local Fox outlet worded things so that there was an implication that the 80,000 crowd was split between the tea party folks and workers' rights group, there were a fraction of (far less diverse) tea baggers. Things have been very peaceful all week. If you watch the video links below, note the mix of ages, colors, unions, etc. represented. Our University of Wisconsin TAA is the oldest in the US, and they are superb. For those who want to portray Madison as a bunch of left-over hippies, wrong. Those occupying the Capitol weren't born and most have little knowledge of the Vietnam War riots. Our part-time teachers' union (many members are past and present TA's) has no flag, bagpipes, or drums, but many of us demonstrated every day inside and outside the Capitol and will continue to participate as we are able. As those with full benefits and good pay look at losing those, we hope they come to understand and appreciate our world of few or no benefits and low pay. We did gain a voice when we became a union in 1996, and now that voice is threatened. 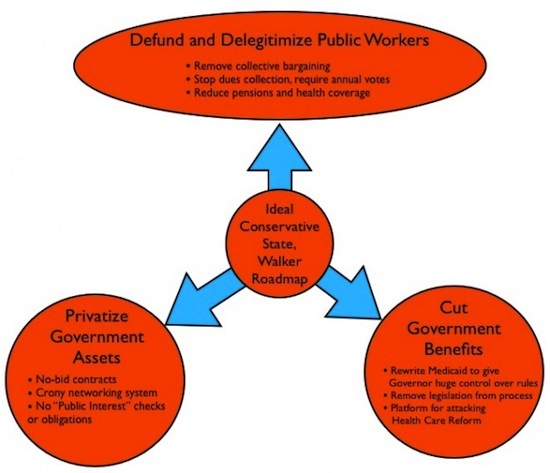 There are relatively simple solutions to the WI budget non-crisis. A one cent sales tax would take care of much, but the Republicans have made "no tax increase" into a religion. Corporations pay very little state tax in Wisconsin. The tax on beer hasn't been raised in decades. The crushing of unions has nothing to do with the fiscal mess – it's a pure power play. It was nice to see supportive Californian Sandy Baringer today in Madison. She braved the drive from Iowa, no fun with our wintry weather. However, protests continue. SUPPORT THE HEROIC WIS-SENATE 14 !!!! As we enter into the spring semester, the struggle to Defend Public Education continues. This semester will play a significant role in the future of this struggle. We will be facing greater austerity measures—budget cuts, continued attacks on public education and social services, and another year of layoffs, fee hikes, and cost increases—not to mention foreclosures and unemployment that continue to devastate our communities. Our schools and communities are being devastated by massive cuts. Students and youth across the globe have been responding to this crisis for years. Over the past few years, we have seen major actions in the UK, Greece, Puerto Rico, France, Argentina, Brazil, and many other countries. January 2011 saw students and youth play a significant role in the uprisings in Egypt and Tunisia ~ and now in Wisconsin. Their courage inspires us, and it is this inspiration that we must bring to our actions. In the US we have organized for two major days of action to defend public education, as part of the larger movement to fight back against the economic crisis. This year, we need to make a strong statement with our actions. It is our turn to step out and be bold. We must join with those fighting racist attacks and the banning of ethnic studies. This year we are calling for Month of Action in March to begin building a stronger student fight back, and to pull the energy of the youth into the streets. People are often afraid to act alone. We must counteract this by being bold, stepping out and showing that we can, and will, win. As we break this mold, as we begin to unite our struggles and share our collective stories, fear will be taken over by inspiration; apathy will be taken over by a desire to fight. We must build our struggle so the media cannot ignore us. We must spread the struggle all over the country and learn from the models in California, New York, Georgia, Illinois, North Carolina, Milwaukee and elsewhere. We are incredibly inspired by the actions of our brothers and sisters internationally and continue to work with them to build for the Spring of Resistance. We know that this fight is not ours alone. We know that it will take more than one month to win it, but we must begin somewhere. We call on all students, youth, faculty, teachers, parents, community members, and anyone who is concerned about the future of public education to join together in building for March. We are the ones with the solutions that can carry us forward. Let us join together in continued struggle. Trend Watching: Jack vs WEA, #StateSOS, Taylorized! 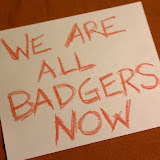 Adjuncts vs. full-time faculty, a Community College Spotlight column, covers mostly Jack & WA HB1631 kerfuffle (why Jack Longmate along with Wisconsin protesters and former AUC classmates occupying Tahrir Square are my personal heroes). In my personal opinion, "Jack vs WEA" counts as a trend because we're going to see more of it, official rhetoric to the contrary not withstanding. Read your labor history. Nothing new under the sun. Wisconsin action, new NH union, and adjuncts at Chicago's Columbia College swapped for even cheaper models are all briefly touched on. In a telling quote closing her piece, Joanne Jacobs writes, "Years ago, I sat next to the chancellor of the local community college district at a dinner. I told him my sister was a part-time instructor at several community colleges with no benefits, no job security and not even a mail slot to call her own. 'Closest thing to slave labor we have in this country!' he said." 9 things you need to know about the Wisconsin action: it's not just about us or even just public employees. George Lakoff why and What Conservatives Really Want. Massive union busting affects all adjuncts - even ones who can't legally organize or don't want to. Don't let them get away with using Public Employees as 21st-Century Welfare Queens. Collective Bargaining is a Human Right, whether or not individuals elect to organize and use it. Remember: Capital is organized; if labor isn't, the redistribution continues. There is a move to make collective bargaining in the public schools illegal again. If that happens, all teachers could become real proletarians, from professoriat to proletariat in just a few short steps. #StateSOS: Wisconsin is our front line. Taylorized! Cast Out in Chicago or trading down. Leave a comment at Inside Higher Ed. Who in their right minds would think this is an isolated incident. Where else is it happening? Campus-wide, as many as 100 adjunct faculty members, many of them with 15 to 20 years of service, have had their course loads reduced, often without notice, with sections either canceled or staffed instead by younger and less expensive teachers, according to the union. Columbia's administration contests the union's tally and says it has asked the union for data to back up its assertion but been rebuffed; the union worries that handing over its list would expose its members to potential retaliation. Inside Higher Ed has seen a partial list of affected part-time faculty members, with initials appearing instead of names, and counted 30 across three departments, in addition to the dozen faculty in arts, entertainment and media management already cited. Spread the word - Students will walk out of all UW schools on Thursday at 12n CST in opposition to Governor Scott Walker's budget proposal that will break unions. Students all over Wisconsin have walked out and schools in Madison are being closed because of "excessive teacher absence," which looks to me like a strike. The attack against collective bargaining, notice that police unions are exempt, is unprecedented but the response to this, which is part of the austerity measures happening across the country, is tremendous and we need to unleash this type of response nationally as the workers, students-- the community as a whole in Wisconsin has. Video follow up to pre-Counter-conference blogging and then IRL + links to Counter-conference videos at Occupy Everything (and/or evacuate ~ love the title, don't you?). Thanks to Michael Wilson for helping me get the right embed code so you can view the video with minimal frustration. Rounding up all the usual suspects and then some: Omnivore, the Book Forum blog, surveys academia as written about online in magazines, book reviews and blogs, via selected, annotated links. From Miller-McCune, blacks and Latinos who apply to the most selective public universities in some "race-blind" states are being reshuffled downward to lower-quality schools, researchers say; and studies find a decline in Asian-American students’ success once they move away from home and go to college. A review of Diary of a Dean by Herbert I. London. A review of No University is an Island: Saving Academic Freedom by Cary Nelson. Does Google Scholar push the most popular content rather than act as a neutral tool? A review of Too Much to Know: Managing Scholarly Information before the Modern Age by Ann M. Blair (and more). Laurie Fendrich on the humanities and human temperaments (and part 2). Challenging the Left: An Objectivist case for intellectual diversity in academia. A review of Academically Adrift: Limited Learning on College Campuses by Richard Arum and Josipa Roksa (and more and more). Cult Stud Mugged: Why we should stop worrying and learn to love a hip English professor. Stephen Brockmann wonders if a key cause of the crisis facing humanities programs can be traced to the culture wars of the '80s. Monty Python's Academic Circus: Nobody expects the Spanish Inquisition — or high modernism in the guise of British goofballery. What is academic work? In academic debate for academic debate's sake, the pleasures are as palpable as they are esoteric. Do rich, white Protestants have a big edge in admissions? .. The State Employees' Association (SEA), SEIU Local 984, will be the Collective Bargaining Representative for the new union of adjunct faculty members in the Community College System of New Hampshire. Earlier today, the NH Public Employee Labor Relations Board (PELRB) ruled that a majority of the System's adjuncts had signed authorization cards selecting the State Employees' Association as the new collective bargaining representative for the 557 eligible adjunct faculty members. The SEA already represents full-time professors as well as clerical, maintenance and other employees of the College System. "Right now, there is a lot of uncertainty among adjunct faculty," said Craig Cushing, NHTI Concord Adjunct Professor of English. "Working together through the SEA, we will bring positive change to the Community College System. Improved working conditions will benefit students – and bring better value for the taxpayers of New Hampshire." "Education suffers when there is high turnover and low morale," said Mary Lee Sargent, an Adjunct Professor who teaches at both NHTI-Concord and Lakes Region Community College in Laconia. "By joining together in a union, the adjuncts will have a voice at the table and will be respected as educators." No, not the fun kind of trend watching that involves music, celebrities or innovations but one that definitely bears watching. 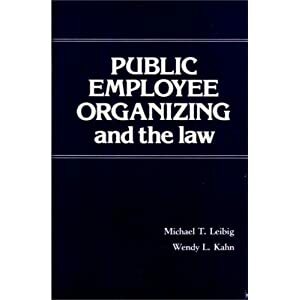 This one is about stripping public service employees of benefits and rights, including the right to organize. All faculty ~ not just adjuncts ~ and staff in public colleges and universities are public employees, as are K-12 teachers, police, firefighters, corrections officers and others. It's happening in other places besides Ohio but Ohio Senate Bill 5 is the one that caught my eye trolling my rss feed reader. SB 5 opponents, including some AAUP members, packed hearing and overflow rooms in Columbus, Ohio, at a committee hearing Wednesday. SB 5, a piece of legislation introduced last week, seeks to prohibit Ohio public employees, including faculty at state universities and colleges, from collective bargaining. Read more detailed coverage in the Dayton Daily News, "GOP has Statehouse clout to change collective bargaining." Proposed collective bargaining changes for state workers would eliminate collective bargaining for state workers, including higher education employees, and calls for the development of a merit-based system; allows employers to hire permanent replacement workers during a strike; remove automatic pay increases for experience and education; eliminate leave policies and automatic sick days for teachers. Time to start collecting and sharing data and narratives. "Trend Watching" seems like a good series for the blog, plus a newsletter counterpart part. The Newsletter Archives page has a link to the online version, link valid for 60 days before Constant Contact archives it and I have to hunt down the new link. NFM Welcomes Its 1,000th Member! PS... we're making plans for 2011. Tell us what tops your NFM wish list by taking this short poll. The usual greeting at this time of year when new years and school terms begin is one of hope and confidence, both of which can be in short supply for so many of us who are uncertain about our class assignments, unpaid until sometime in February, or just plain unemployed. We hope that some of that anxiety might be relieved by the knowledge that this year holds much promise for NFM and therefore for all faculty and others determined to hold higher education to the standards of integrity that students, our colleagues, and the public expect and deserve. Earlier this month I was in LA to introduce NFM at a session on contingency at the 2011 MLA Convention, and then to participate in the January 8 "Counter Conference" organized by NFM founding Board member Bob Samuels. (You can read my brief report elsewhere in this edition of the newsletter.) The biggest NFM news that I reported at both conferences is the progress we've made in the last several months on forming our nascent 501(c)3 NFM Foundation, an affiliated nonprofit that will focus on fundraising, public education on a broad scale, support for targeted research on contingency-related topics that have been misunderstood or neglected, and other projects that fit most properly into the category of educational and charitable activities. Our fiscal agent, which provides us with the legal ability to fundraise while our 501(c)3 determination is pending, is CTAC, the Community Training and Assistance Center in Boston, MA. We have several fundraising prospects in the works and hope to have happy news to report very soon. Meanwhile, we are continuing to build membership -- see the profile of our one thousandth member! -- in NFM proper, which is a 501(c)6 tax-exempt professional organization that promotes better working conditions for its members through activities, including lobbying, that are free from the restrictions placed on a 501(c)3. By having two affiliated nonprofit organizations, we believe that we can expand and maximize the opportunities available for accomplishing our core mission, which is of course to end the exploitation of adjunct and contingent faculty at colleges and universities nationwide. Open Words is a journal dedicated to publishing articles focusing on political, professional, and pedagogical issues related to teaching composition, reading, ESL, creative writing, and literature to open admissions and non-mainstream student populations. Edited by John Paul Tassoni (Miami University Middletown) and William H. Thelin (University of Akron), Open Words is a refereed journal published twice yearly. The fields of composition and literacy studies have struggled with these three issues for decades. Scholarship and policy statements on contingent labor are replete with calls for equity, variously articulated but vigorous nonetheless—and with occasional exceptions, largely unsuccessful. The intensity with which we've written about open-admissions and open-access higher education institutions has waxed and waned over the years, but big questions about the roles of literacy instruction, the micro- and macro-politics of higher education, critical pedagogy, and many more bear on the working, teaching, and learning conditions of open-access campuses as heavily as, if not more than, anywhere else. Finally, we've thought and written a great deal about working with non-mainstream students (i.e., students often served by open-admissions institutions, but increasingly at other kinds of schools as well), and again, still face large-scale structural problems with ensuring equitable opportunity and quality learning experiences for them. Individually, the problems facing contingent faculty, those facing open-access institutions, and those facing non-mainstream students are difficult. Taken together, we believe they are exponentially more complicated. Please submit manuscripts electronically, in MS Word (.doc or .docx) or Rich Text Format (.rtf), to Seth Kahn (skahn@wcupa.edu) by June 1, 2011. Members of the editorial team will also be attending the April 2011 CCCC in Atlanta, and will be available for consultations/conversations then.